The Great Pyrenees is an admirable companion, but it's not a breed for everyone. Learn what these dogs have to offer and the kinds of challenges that life with them presents. The Great Pyrenees, also known and the Pyrenees Mountain Dog, is an ancient working dog whose purpose was to guard livestock from predators. In fact, Pyrenees were such strong fighters that they may have even been used as dogs of war. Although traces of the breed's ancestors have been recorded back to almost 2000 B.C., these dogs really became established with the nobility of France around the seventeenth century. 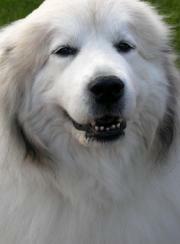 The Pyrenees is a majestic canine, built large and strong as befits his working history. These dogs are primarily white, but they can have shadings of tan, reddish brown and gray. These additional colors should cover no more than one third of the body on the ideal specimen. The coat is very dense and quite resistant to all kinds of weather. It also serves to protect the dogs when battling predators in the field. The size of the breed is impressive, but the double coat adds to this perception. On average, Great Pyrenees stand about 30 inches tall and weigh between 90 to 100 pounds. They are muscular, yet very balanced. The head is wedge-shaped with rich dark brown eyes and drop ears. The coat is longer and especially dense on the neck and chest with longer fringe along the lower body and tail. The tail is carried low, out or over the back as the dog's mood dictates. Pyrenees are generally calm dogs, observing everything that goes on around them. This state of alert concentration serves them well in the field. They are gentle and affectionate with members of their own family, but they are not as tolerant of strangers and other animals. Although they make good guardians for the children of their family, the dogs need to be raised with those children as pups to be properly acclimated. When provoked, the Pyrenees is absolutely fearless and will go to great lengths to protect those he feels are in his charge. Loyalty is a key trait to this breed. With such strength and a sometimes stubborn attitude, early training is essential to make these dogs good companions. It's in their nature to rule the roost if they can, and this includes trying to assert dominance over their caretakers. Therefore, the dogs should attend puppy socialization classes to learn basic manners, and then proceed on to obedience training as soon as they are old enough. It will be necessary to reinforce this training throughout the dogs' lives in order to maintain consistent behavior expectations. If you relax, your dog will take it as an invitation to take charge for himself. Any large working dog requires a good deal of exercise to remain physically fit and mentally balanced, or else behavioral problems can arise. 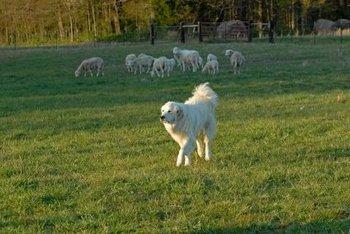 Unless the Pyrenees is used as a working dog in the field, it is necessary to provide him with daily exercise. This can include long brisk walks, jogging and even a raucous game of fetch. When physically and mentally stimulated, these dogs are much more composed the rest of the time. This breed's dense coat requires regular brushing to keep it in good condition and remove loose hair, especially during the annual shedding each spring. Bathing such a large dog can be difficult, so it's easier to use a dry shampoo as needed and reserve full baths for when the dog is truly dirty. On average, Great Pyrenees live eight to ten years. Like many large breeds, they are prone to hip dysplasia, so it's important to watch their weight during their developmental years and avoid obesity to minimize joint stress. This breed was developed for colder climates, so the dogs must be protected from extreme heat. They are also prone to developing hot spots on their skin. The demands of caring for such a large dog coupled with health issues has left a growing number of Pyrenees in need of rescue. Visit the Great Pyrenees Club of America to learn more about the situation.